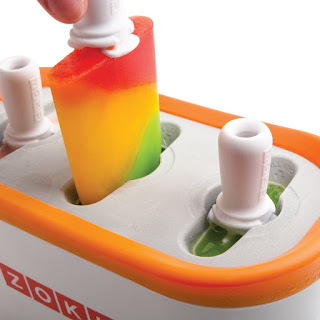 What do you think of this Zoku Quick Pop™ Maker? Great idea or waste of money? The patented Zoku Quick Pop™ Maker freezes ice pops in as little as seven minutes right on your countertop without electricity. Quickly make striped pops, yogurt pops or (for the first time ever at home) flavored core pops. To enjoy Quick Pops at a moment’s notice, simply store the compact base in your freezer. The kit includes six durable, reusable plastic pop sticks that have unique ridged designs that allow pops to adhere securely, with special drip guards for tidy eating. A specially designed Super Tool helps to quickly release the frozen treats from their molds. The unit can make up to 9 pops before refreezing the unit again. Includes 1 Quick Pop Maker, 6 sticks, 6 drip guards, and 1 Super Tool.